Facebook has quietly introduced a new feature to Messenger that makes sharing photos a little easier. Going forward, a new addition known as Photo Magic will monitor your camera roll and will automatically recognize pictures that feature your friends. So if you took a ton of photos of your friend Caidan over the weekend, Photo Magic will nudge you to share those pictures with him. The new feature is opt in, of course, so if you don't want Messenger telling you to share photos, you can just turn it off completely. However, Facebook says the new feature is meant to encourage users to share, rather than letting these photos collect dust in a user's camera roll. Peter Martinazzi, who is part of the Messenger team, said he often did nothing with pictures once they were taken, something that likely is common with a lot of people. Photo Magic apparently solves this problem. When you first boot up the update, the app will scan your most recent photos that include Facebook friends. Once it finds a match, all it takes is one quick tap and it'll be sent off. The next time Photo Magic recognizes that person, it'll ask if you want to send it to them. It sounds seamless and easy, and that's the point. You'll have to be comfortable with Facebook constantly scanning your photos in order to truly be on board. Messenger's new feature is essentially like Moments, another Facebook app. Unlike Moments, however, chances are your friends have Messenger already installed; it standardizes the feature and further improves the quality of a platform that attracts 700 million monthly users. Photo Magic makes sharing photos with friends super easy. But, then again, there are dozens of platforms already out there that make sharing photos super easy, and none feel quite as invasive as what Facebook is offering to do. 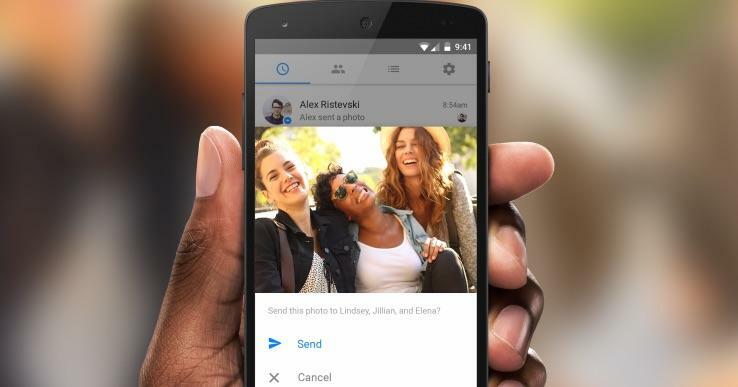 Messenger users on Android in Australia get first dibs, with an update to iOS set to arrive a few days later.